I wanted to make my friend a necklace for Valentines Day, but I was stuck at home due to a nasty winter storm, so I couldn’t go to the bead store to get supplies. Well, I knew my friend wore gold and her favorite color was purple. 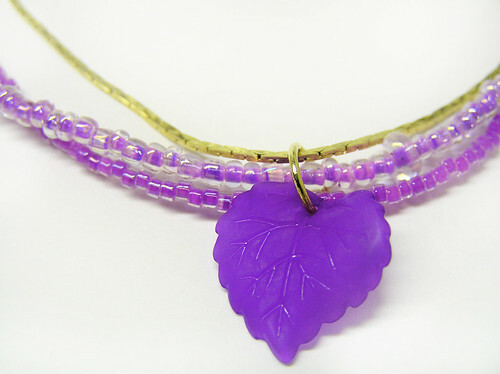 I happened to have a couple vials of purple beads in my stash I hadn’t used for anything. I also had a single gold chain sitting in a box from Christmas that a distant relative gave me that I would never wear. I’m not one for re-gifting things, so I thought I could revamp the chain and make it into a 3-strand necklace! It was super easy, and I was pleased with the result, so I thought I would share how to make one. Clasps aren’t needed as they are already attached to the chain! Bonus! Step 1) Lay the chain out flat and measure a length of fishing line a little longer than the chain. Leave at least 3 inches extra to allow the strand to be attached to the chain at each end. Step 2) Thread a crimp bead onto one end of the fishing line. Thread the end of the line through the jump-ring attached to the chain, loop around and poke it back through the crimp bead. Close the crimp bead. Leave a small tail of fishing line, as it should be weaved under the first few beads for more stability. Step 3) Bead the entire strand, just make sure it’s a little longer than the original chain so they don’t lay directly on top of each other. 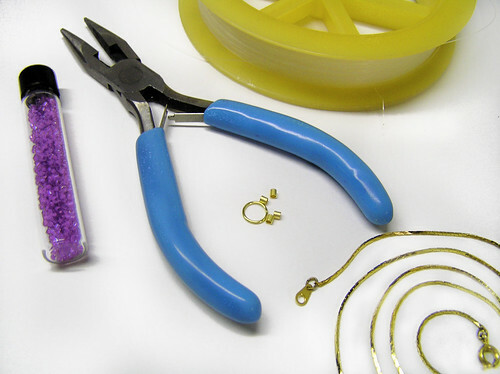 Repeat the process in step 2 to end the strand and attach it to the other end of the chain. Make sure to weave the ends of the fishing line through a few beads after you have closed the crimp bead. Step 4) Bead the second strand the same way as in step 3. Step 5) At this point you can choose to add a pendant or not. To add a pendant, slip over the small clasp end and over all 3 strands. Center the pendant and presto! A pretty gift for any occasion.